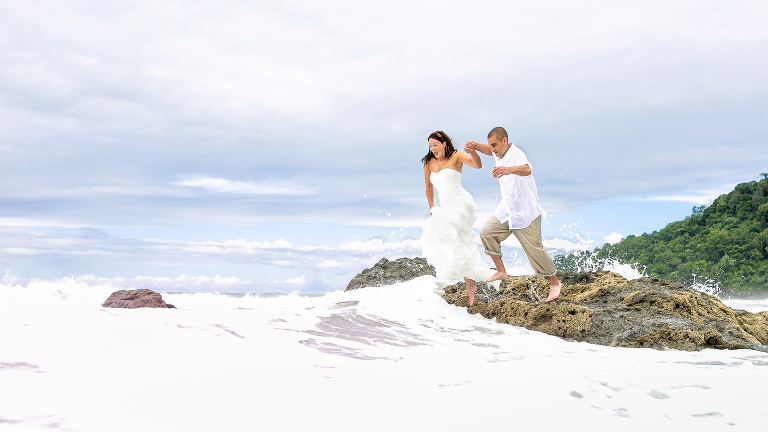 Costa Verde Costa Rica Wedding Planning | so many options for your dream wedding. If you and your significant other are planning to have a destination wedding it’s safe to say that you are adventurous people. Thus, Costa Rica is without a doubt the place for you two. From ziplining through the tropical jungle to parasailing over the majestic ocean, there are plenty of adventures in store for those who come to this beautiful little piece of the world. But what about those of you that like to mix luxury with adventure? What if you want to go horseback riding on the beach one day, and spend the next having the spectacular wedding of your dreams? Complete, of course, with beautiful decor, delicious food, and the best toe-tapping tunes to get your guests dancing all night long. The answer is Costa Verde. Nestled in the jungles of Manuel Antonio it’s just 300 yards from the beach by the world famous Manuel Antonio National Park. Costa Verde has everything you need to create the wedding of your dreams. Costa Verde has it’s own wedding planner that will take care of all the pesky details for your big day. An experienced wedding planner is especially important for destination weddings. Remember, you are not able to be there during much of the planning process so good help is invaluable. You should get to enjoy a hassle-free day and vacation. Thus, Costa Verde’s wedding planner will help with everything for you and your guests during your entire stay. Your wedding can be as extravagant or as simple as you want it to be. Either way you won’t have to be worried or stressed about any of it. This hotel literally has everything you want in accommodations in a tropical setting. Tucked in the jungle wildlife like monkeys, sloths and toucans abound. Take a moment to relax at any one of 3 cliffside pools. Imagine the spectacular views from up there! It’s the perfect way to wind down after a day of adventuring. You can use the onsite spa services to shed the stresses of daily life and just relax and enjoy your vacation. Now doesn’t that sound so much more enticing than all the horror stories you hear from your friends? They said they were so stressed out during their wedding they didn’t even get to enjoy it! As far as rooms go, there is plenty to pick from. You can choose the spacious penthouse with panoramic views of the Pacific Ocean. Or opt for the slightly smaller but still spacious studio apartments of varying sizes offering a variety of jungle and ocean views. Being built into the ridge is advantageous in that nearly every room offers a spectacular view. One of the newest rooms even has its own hanging suspension bridge! Bridal Suite has a gorgeous view of the National Park. Hanging suspension bridge at Costa Verde. For those who want to pull out all the stops and stay in a truly unique place you’ve got to check out Costa Verde’s claim to fame, the refurbished Boeing 727. While not the only plane converted into living quarters in the world it certainly is still a very unique and interesting place to stay. Plus, you can get ready for your wedding in style. Now if visions of boring white or gray airplane interiors and uncomfortably cramped quarters are filling your head, stop. Right now. Costa Verde’s airplane suite is anything but boring and cramped. The walls of the interior feature exquisite teak with intricate carvings made by expert local craftsmen. The furniture is also all teak and are hand carved pieces of beauty. With two bedrooms, two bathrooms, a kitchen and covered balconies over each of the wings this suite has everything you could ask for. The best part is the plane is elevated 50 feet up in the air. 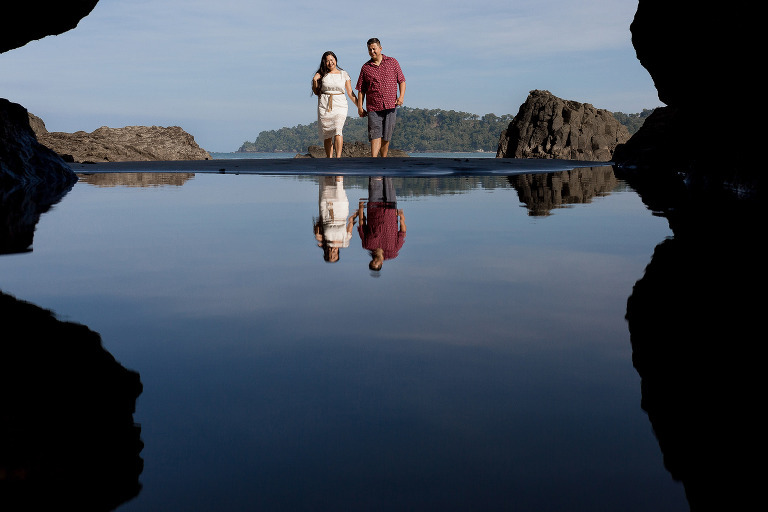 That means you get a bird’s-eye view of the lush Costa Rican rainforest and the Pacific Ocean. It’s almost as if you were flying through the jungle! Imagine waking up on your wedding day to monkeys hopping around on the balcony. Plus, simply the coolest surroundings to get ready in. Just think about the photos ops up there! How many wedding photos do you see where the happy couple is kissing in a cockpit with majestic ocean and jungle views out the window? Dreaming of exchanging vows to the soothing sound of the ocean with sand between your toes and the setting sun casting the world with a happy orange glow? 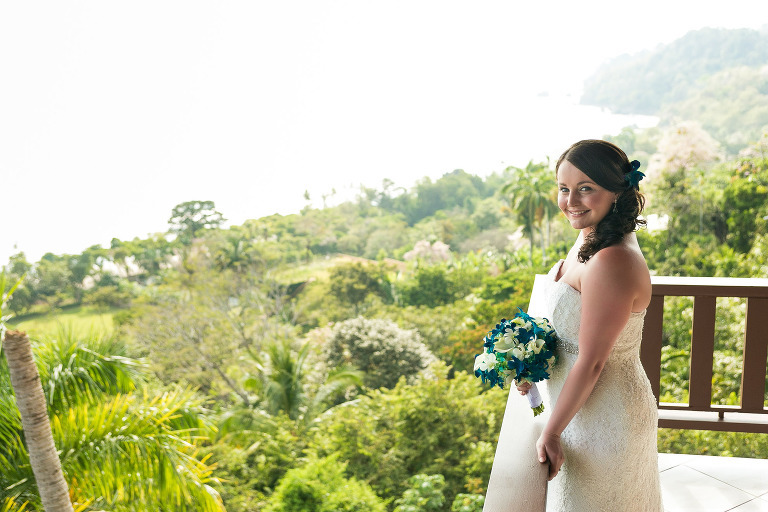 Costa Verde offers some of the most elegant setups for beach weddings in Manuel Antonio. Moreover, as the hotel is conveniently located close to the beach the venue offers a poolside spot with a breathtaking view of the ocean where you can stage your ceremony. For more intimate ceremonies the grassy knoll, a private garden that still offers a beautiful view of the ocean, is perfect. For a larger, more grandiose event choose the wedding deck affectionately dubbed the “wedding helipad”. The deck juts out over the jungle and offers virtually 360-degree views of ocean and jungle. Time your ceremony to happen at sunset for a perfectly spectacular show of the caliber that only nature can provide. Intimate Beach Wedding by Costa Verde. The famous wedding Helipad at Costa Verde. Pool side wedding overlooking the National Park. The Grassy Knoll ceremony area always has this amazing golden light. For the reception, Costa Verde offers several options. All are covered, which is important particularly during the rainy season when the evenings often bring some tropical showers. You come to Costa Rica to enjoy nature but not to get taken by surprise by it! The open air wedding pavilion is perched up on the ridge with, of course, spectacular views and is large enough to accommodate up to 250 guests. This spot is great for lavish affairs with a live band (or an awesome DJ) to get the party going and have everybody rocking out and thoroughly enjoying themselves. Costa Verde offers four different restaurants, each with their own style. The second floor of El Avión, which by the way has been built around the fuselage of a C-123 Fairchild plane, offers a great space for up to 100 guests. For more intimate affairs, you can choose the private tavern at La Cantina which has space for 60 guests. Bride at La Cantina Restaurant in Costa Verde. With so many different options for accommodations, ceremony and reception sites, Costa Verde has something for everyone and every budget. Their fantastic staff is happy to help you plan a stress-free destination wedding and tropical vacation. You will be so happy you chose the resort for one of the most special days of your life!